For the trendy ladies who like to step out in style, we have a cool collection of western Tops for Women. Check out our latest range exclusively designed for the modern working women keeping up with the changing trends without compromising on comfort. From office wears to party wears, you can find a delighting variety of tops and shirts from well known brands. Blanch Grey T shirt with an attractive print of spectacles and the title “Chashmish”. It is perfect for a cool spectacled girl’s college day wear. Among casual tops for women, this is apt for a cool wavy look on your girl’s day out. Made of soft cotton, it is priced 449. Top it up with cool denim bottoms for that perfect look. Check out this violet colored Up Down long tops for women with a black lacy patch work on the sleeves. Plain violet color highlights the black patch work. The up down pattern is also an in thing and adds style to this top. It is a must have in your winter wardrobe. If there is something that will never go out of fashion it is Denim. Be it jeans, jackets or shirts, Denims grab attention everywhere. They are apt for a casual look Ladies tops specially in the winter. The latest addition is the Denim dress that stands out in the crowd. 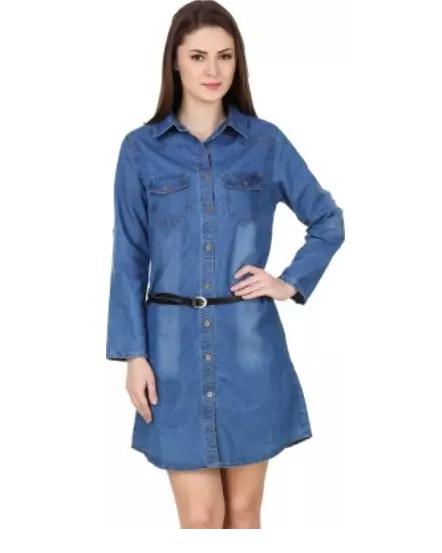 Try this Denim Shirt dress and you will get compliments wherever you go. Of all printed ladies shirts and tops, this one is a style apart. The prints of red kissing lips are not just cool but hot to say the least. This is a full sleeve shirt with classy stitching. Coupled with the prints, they look trendy and stylish.